Well, now that’s done! 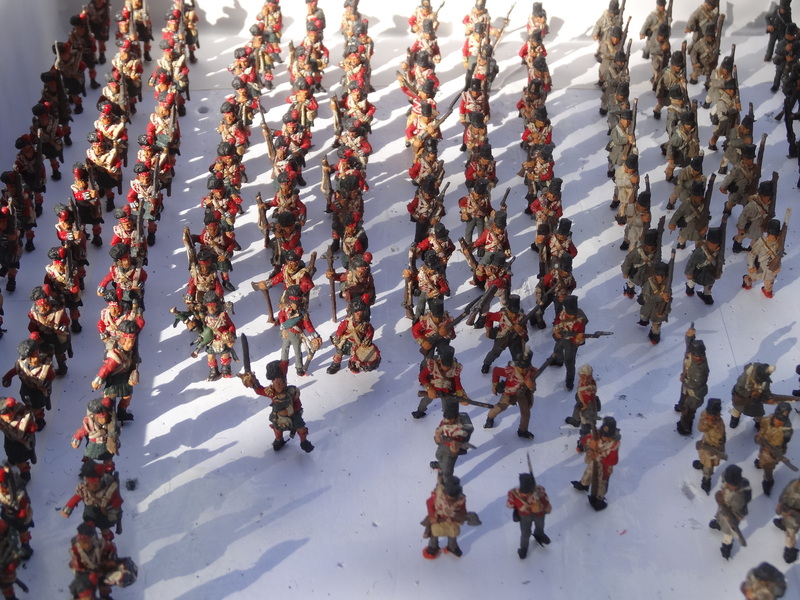 247 infantry figures painted for the next diorama, a good number for the size of the base. As usual I feel it might be a bit of a squeeze- I’m yet to fit all the figures I have painted on a diorama. In the past I have shied away from the Scots as the painting of kilts was a little difficult back in the early days with the Airfix guys, but once I got hold of the Strelets figures they were so well done I had to include them . They turned out ok to me ( I don’t count myself as a great painter ) and once they are all in place my imperfections won’t be as obvious . The figures are 99 percent Strelets with a few conversions thrown in for variety. The quality that they put into the ‘Scots and the British– Stand at Ease’ is to be commended and make it a lot easier to paint. I must add, that the tips I have picked up from others in regards to painting (as in giving them a final wash after painting) has greatly improved my work and to those I thank you. Now I’m just looking forward to putting it all together in the near future. Impressive work! Looking forward to seeing the finished diorama! My dad used to paint 54mm figures and did a brilliant job on kilts – in 20mm, I just paint ’em dark green and paint a few thin yellow lines on (he’ll never know I’ve said that)! Thanks mate ,I have done something similar ,first dark blue ,then some black lines followed by some green ,seems to work on the little figures as you said ,it is something your dad couldn’t get away with on 54’s .